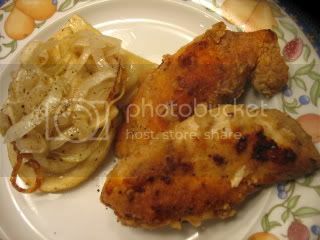 Cuisine Kathleen: Friday, Food and Flashbacks! Today I have a few things for you. I visited a restaurant at the end of L.I. in Montauk. They served a salad, nice crisp greens with a goat cheese disc on top. Cut the discs, and flatten in saran wrap. (the goat cheese comes in a cryovac log, available at Costco, etc) Place in the freezer until ready to use. the oil of your choice..just brown quickly, and keep warm if you are serving right away. Keep them in a warm oven till you are ready to plate. When you cut it open it will ooze out...This one got a little cold waiting to have its pic taken, so it didn't exactly ooze, but you get the idea! 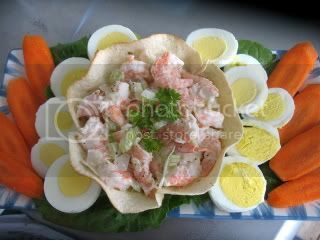 I used 71-90 size shrimp, which was a perfect size for the salad...celery, onion, pepper and mayo..simple. 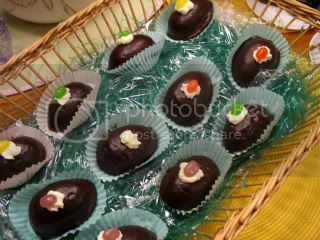 And some devils food cake eggs dipped in chocolate.. These Hats I did for a Darling Baker cupcake event for a now defunct blog..but they would be great with a spring color ribbon or piping for Easter.. Please visit Gollum's blog to see the other Foodie Friday participants..
Susan at Savoring Time in the Kitchen posted a recipe for a delicious oven braised beef. with brandy..
Foley at Follies Folly a great sweet chicken bacon appy. Foley is having a Mother's Day event, and you are all invited. 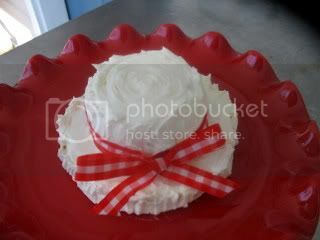 Mr Linky will be up for you to post a favorite recipe of your mom's or grandma's, and maybe you have a special plate or dish related item she gave you. A wonderful way to honor the women who raised us.. Thanks for your visit, please come again! 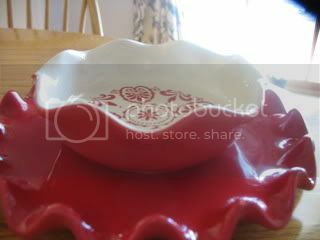 Just LOVE your tablescapes and the food! You never fail to inspire and stimulate my appetite! Great table! Thanks for visiting my blog and telling me about your friends photos from the Flower show. I have so many photos but want to say that her photos are wonderful. I try and go every year. I use to live 30 mins from Philly. I fly up now and meet all my friends for the weekend. I hope you get to go one year as you will enjoy it. You know how to get to me with these DISHES, culinary and otherwise. I love the rabbit box and the small, rectangular plates that you stacked. The chocolate dipped cakes look scrumptious! ROTFL, I love the shape comment, you always crack me up! Love the new blues, very pretty! You come up with the best tables, Kathleen! Your chocolate dipped cakes look yummy and that salad with the warm goat cheese -- a favorite here at Linderhof! 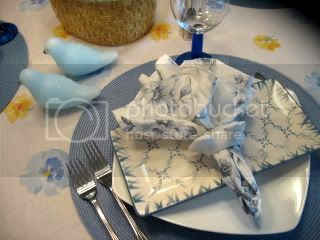 A pretty table setting as well! Kathleen, I'm craving your shrimp salad, and John would love the goat cheese disc. I know a little girl who would love the Debbie Mumm egg basket. ... 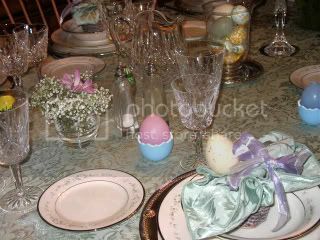 Such a cute springy table setting. And I definitely remember the devil's food cake eggs dipped in chocolate. You did a great job making them. They are adorable. 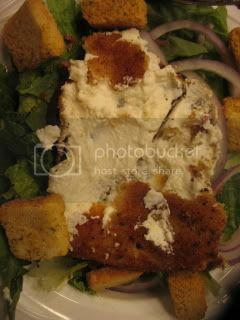 Love the salad with the goat cheese, looks so good! 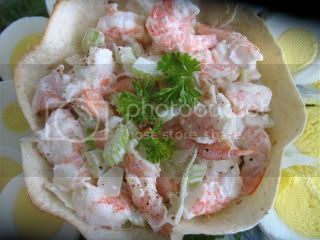 Also the shrimp salad...I could live on that for a long time!! 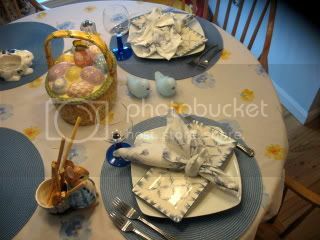 I remember the devils food dipped eggs from that other blog...your tablescapes are perfect as usual, I think I need to hire you! 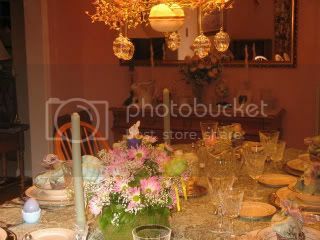 Oh, Kathleenn, this is one of your best posts... so many pretty things, dishes, tables and food! And linking some of your DFs (darling friends!) is really sweet. I just love salad with goat cheese. Don't know why I never make it at home! Pretty basket! 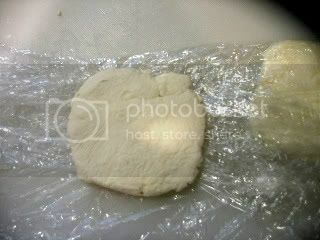 I'll try to post my cookies soon. I really love, love that blue and white rect. plate! CTS? Recent? I didn't see them. And I WANT that shrimp salad! DH won't eat shrimp so I never make it for myself. 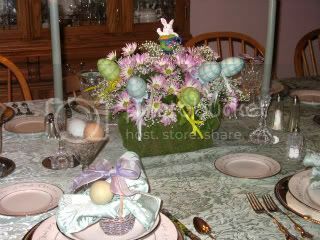 The Easter talbe is super pretty... are you having Easter this year? ;-) The eggs...gosh, they look good! And the cupcakes are just adorable. Isn't Spring just a wonderful season? This is a beautiful post! Is that Waterford Lismore I see? I have bridal brain and see patterns of china, silver, and crystal in my dreams. Please share how you did the devil's food eggs and the tortilla bowl! 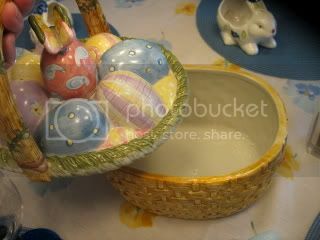 The eggs are made in a Wilton egg cake pan. I think they still sell them, I have had it for years. I used to make 200 for orders at Easter. You can use any Devils food cake recipe. I use a melted choc icing recipe and dip them in the choc. Some of them have a cream cheese filling. Then pipe with icing..add a jelly bean at the last minute as they run! For the tortilla, I brushed the dish with olive oil, and just baked it in a little ruffled ramekin...I will go back and add the pic to the post so you can see. And thank you everyone for your kind comments! Such a pretty table setting. Love the egg basket. 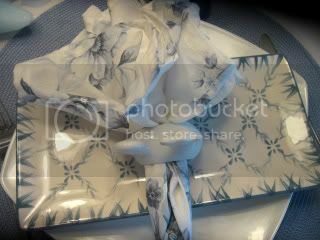 I've got the 'Square' blue & white from the CTS...aren't they wonderful? Your food, once again, is just heavenly! You are amazing....Are you sure you aren't related to the 'Duracel Bunny? Oh, Kathleen! Food, dishes, lovliness - complete eye candy to make me drool! I love everything you posted about! You have such beautiful things Kathleen. Your flashback table is so pretty. I really like the eggs handing from the chandelier too. And that centerpiece! And that precious little hat cupcake. Your shrimp salad is making me hungry and I just had pizza. I don't remember seeing the bottom of that red bowl. Neat pattern. Those blue plates are nice too. Very unusual. I thought about you today. I bought a big round tablecloth from GW for $1.50. I don't have a round table but I couldn't pass it up lol.I think I'll use it as a backdrop. Your tablescape is so pretty. I love the salad with the goat cheese. I'd love to try that at home myself! Yum. That shrimp salad looks delish! I also really enjoyed seeing (and drooling over) the devils food cake eggs! Your dining room light looks very festive with the eggs hanging from it, I have done that before too. Very cute!! 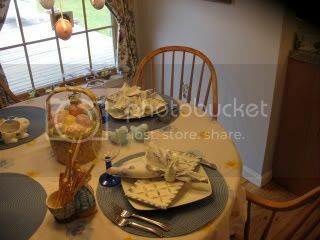 Kathleen, lovely tablescapes as always! 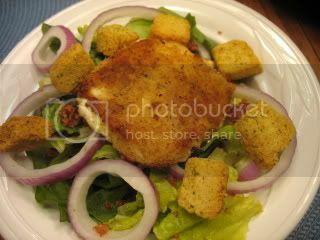 Saw Ina make a mesclun salad with the goat cheese croutons recently. Jotted down the particulars ... gotta try it some day soon. 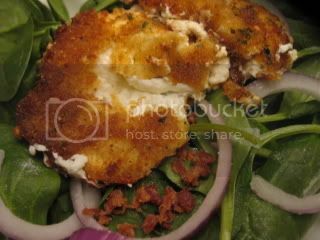 I have had salad with the fried goat cheese on top! It was delish! They also added a few dried cranberries and some pecans which had been cooked in butter and sugar.